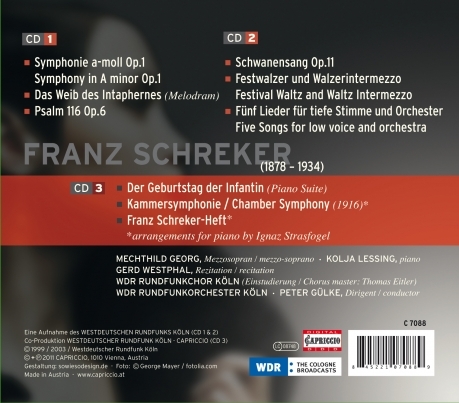 Gerd Westphal · WDR Rundfunkorchester Köln · Peter Gülke u.a. 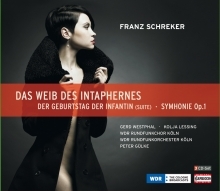 Der Geburstag der Infantin (Piano Suite) · Symphonie op.1 · Festwalzer und Walzerintermezzo · Ein Tanzspiel etc. 35 years apart, of his output, the whence and whither of a composer who already in his twenties saw himself branded as „begetter of musical narcotics" and whose name still evoked, for many people, „art nouveau of some kind". Weib des Intaphernes, composed on a ballad by Eduard Stucken in 1932/33 in Estoril, near Lisbon, and in Berlin; Once more the sure hand of the dramatist in masterly control of his means is shown; with a few concise motives he creates cohesion of form, and can employ a simple triadic motive as certainly as an inscrutably rugged atonal fugato.